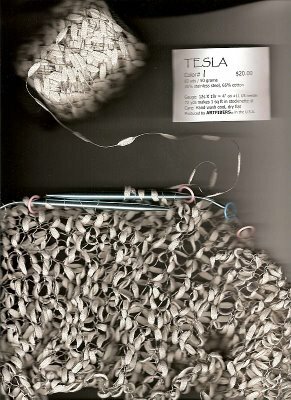 I don't often blog in real time, but I am knitting today. 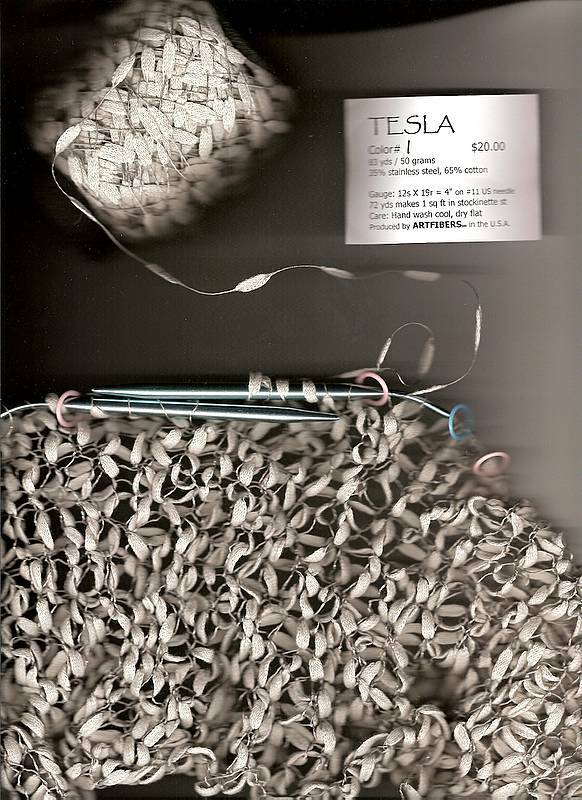 This is the easy way to knit with stainless steel. The pattern arrived from Kira yesterday and I started it last night. Mark spent a large part of today cataloging his DVD collection on dvdprofiler.com. Click here for the full list. Up until now, he didn't know how many he owned. In his defense, he says that the boxed sets are overcounted because the boxes count as one entry. E.g., a 7 DVD boxed set would be cataloged as 8 items. He told me (only half tongue-in-cheek) to keep buying fabric so he won't feel so badly. He blames Warner Brothers. When Iris was 22 months old, we showed her the first Harry Potter movie. (Yes, that was kind of young for a PG movie, so maybe we should rename this blog badparents.) We showed her Annie Get Your Gun shortly after HP1. As soon as the WB logo came onscreen, she excitedly called out, "Harry Potter!" After the initial disappointment of not seeing HP1 again, AGYG became her favorite movie. She asked for it by saying, "I want to see not Harry Potter!" AGYG aka NHP was replaced in her affections when she was 2 1/2 by the movie Chicago. (Relax, we only showed her the musical numbers.) You should have seen the expressions on people's faces when she told them that her favorite movie was Chicago. Have you ever seen a toddler sing "Cellblock Tango?" Pop, six, squish, uh-uh, Cicero, Lifschitz. Whenever she got upset, we would call out, "Pop". She would respond with a six. Then we replied squish... It calmed her down and worked for months. Mark's collection has surpassed the next centennial. We will have to add on to our house to hold them all. Caitlin Flanagan does get it. "Sometimes people say, 'Caitlin Flanagan, your life doesn't really matter. You don't stand for a lot of people,' " she said. "No. I don't. But I'm trying … to understand the things that are going on in my day-to-day life in this larger context of … history [People say] 'She's so hypocritical!' And I'm trying to say, 'That's what the book is about.' It's a kind of life, a way of life that's wrought with divergent conflicting impulses." It's springtime and the leaves are coming out. I have been knitting leaves in the evening. My first attempt in wire did not seem quite right. I took out a skein of Thick & Quick from the stash and experimented with several leaf shapes. I ripped and tried anew several times. Finally, a pleasing leaf appeared. Then another one followed, and another one... Pretty soon, we had a whole laurel of leaves. 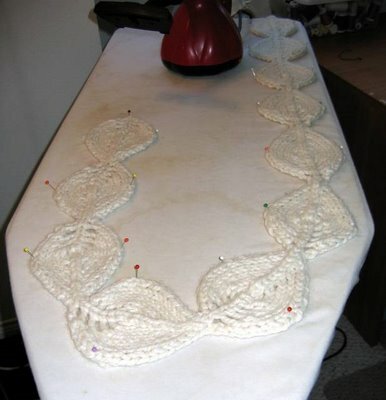 Here they are blocking on the ironing board. The red patch at the top of the image is the Scunci steamer that Annie gave as a hostess gift. Thanks, Annie! 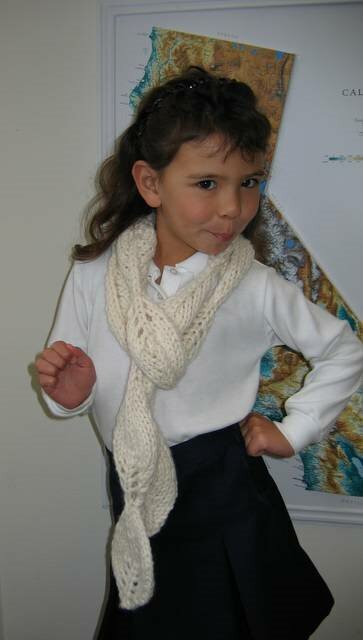 Here is the laurel/scarf in full disco action. As an extra bonus, I will show the ultra-high-tech weather station ca. April Fools' Day 2006 at Chez Bad Mom. 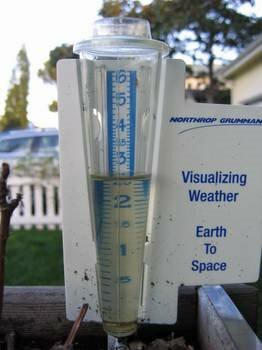 Even though it was April Fools' Day, I did not doctor the photo or the rain gauge. 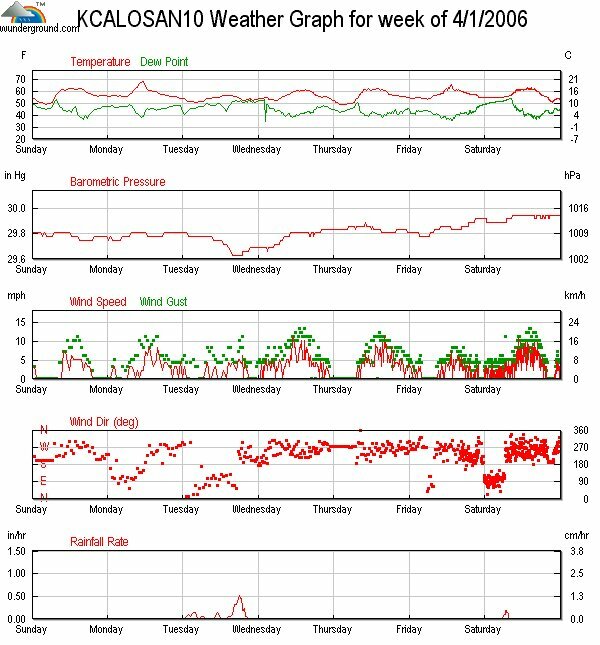 It really did rain that much in the storms that preceded 4/1/06. 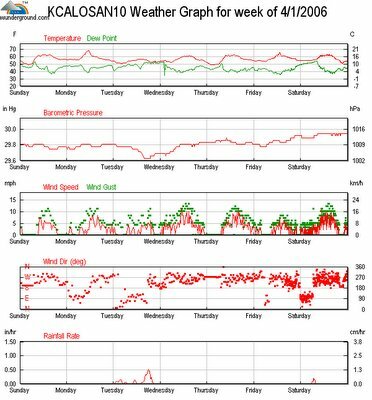 You can view the full Wx data at nearby Sally's House yourself here. There was a little bit more rain at my house than at hers. You know how localized rain bands can be. …except for chumps like me. California allows drivers to make right turns on red as long as they stop their vehicles completely behind the limit line first. The more massive the vehicle, the less likely the driver follows the rules. Most people slow down slightly while making their turn, yielding to other vehicles that have the green light. Pedestrians are treated as nuisances to be intimidated out of their right of way. Now that is a really good reason to finish your thesis. I disagree with Woody Allen. Right turn on red is a sign of CA's cultural superiority over NY. Iris and I accomplished alot one evening while Mark cooked dinner. I set out some t-shirts, stencils, foam brushes, fabric paint and dishwashing gel. Iris went straight for the Iris stencil and colored it exactly like the example pictured in the stencil book. I let it dry overnight and then heatset it by ironing it from the back with a paper towel to protect the ironing board. 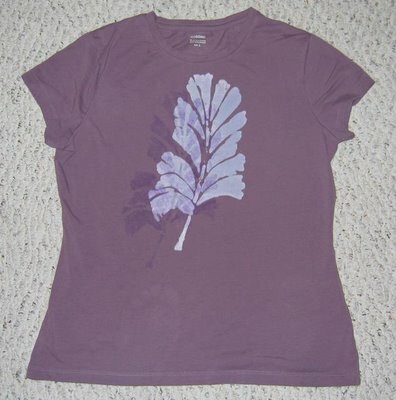 The shirt has been worn and laundered several times and it looks pretty much the same as when she applied the paint. I used the gel dishwashing detergent (Target house label, like the t-shirts) to discharge a leaf design. I should explain that discharge means to remove the the dye with the bleach in the dishwashing gel. Only dishwashing gels with bleach will work. The liquid stuff will just run right off while the gels stay put where you want them. 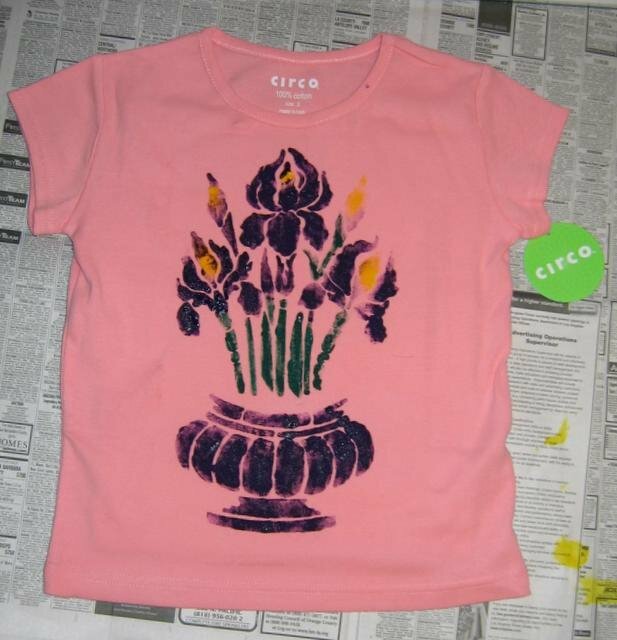 Then I made a "shadow" using fabric paint. 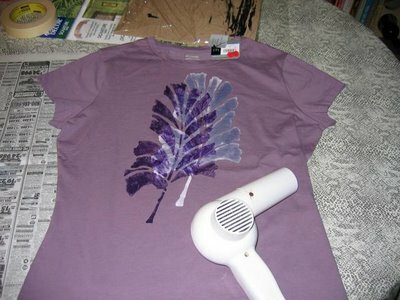 I tried to heatset the fabric paint with a regular blow-dryer because I don't have a heatgun at home. (Come to think of it, I haven't worked in a lab with a heatgun in over a decade.) I then put the shirt in a bucket of water with spoonful of bleach stop and swished it around. I threw the shirt in with the next load of laundry a day or so later. The hair dryer was too wimpy to set the paint as most of the "shadow" washed away. I actually like it better with the faint "shadow" than the brighter original. Our cleaning lady, L, has given notice. Now I am in a quandary. Should we replace her or manage on our own? How will we manage with my illness? Like Barbara Ehrenreich, I have reservations about hiring someone to clean up after me. I don’t believe that there should be a class of people who make messes and another class who cleans up after them. L began cleaning for us when I was pregnant with Iris and on bed rest. I didn’t have any ethical quandaries back then. I was clearly unable to do the work myself. L is a US citizen who worked for herself, and dictated the conditions under which she would work. We paid her well. According to Ehrenreich’s book, Nickel and Dimed, L was in the top 10 % of housecleaners in the country in both wages and being able to dictate her own working conditions. When she bought a house 50 miles away, we were one of only 3 families in this area that she made the commute for. In college, I cleaned and ran errands for a disabled woman. I told L that on her first visit to our home. That must have struck a chord with her because, when her daughter moved to the US, L brought her over to my home to introduce us. She told her daughter that I, too, used to clean other people’s houses. I moved on to better employment and now L is doing the same. L said that housecleaning was too hard for her shoulders, allergies and asthma. I could tell that she didn’t want to break the bad news to me in her last 2 visits to my home. Finally, she had to tell me that it would be the last time she came to clean for us. We chatted for a bit about what she will do next. I found out that she has worked 28 years—9 of them housecleaning, the rest in childcare. (That is a remarkably long work history for someone who is only in her early forties.) She told me about her job interview (in retail) and how excited she was about the training they were offering her. I am happy for her, but panicked about how I will cope without her. Mark has no such ethical reservations; he says we must replace her. However, he has left the task of finding a suitable replacement to me. A generation ago, when my husband was raised, the cleaning and non-cleaning classes were simple to distinguish. Women did all the cleaning. But now we are supposed to live in an enlightened age where that is not taken for granted. How far have we really gotten? Read Caitlin Flanagan’s article about How Serfdom Saved the Women’s Movement. I am uneasy with the full commoditization of housework model. Some would say it is more efficient to spend your time doing higher order (better paid) things and to outsource housework to someone cheaper. But that brings up a whole new can of worms. I have never been comfortable with the low wages of childcare workers and (most) housecleaners. Once, it was taken for granted that mothers, wives, sisters and daughters would do the cleaning. In those days, mothers who worked outside the home made ad hoc arrangements to replace their household labor. In certain parts of the country, one could find workers who, due to racism, did not have other job options. Once civil rights and women’s lib took place, we started importing women from other countries. My idealistic self wants to follow the advice of Lillian Moller Gilbreth and teach Mark and Iris how to clean. I especially liked the part about setting toddlers to work dusting furniture legs. ;-) Iris lives in a world where all her classmates also have someone outside the family clean their houses. I do not want to raise a daughter like Monica Lewinsky who, when it was her turn on the chore roster, did not even know how to clean the bathroom she shared with her roommates. I have to run to yet another doctor’s appointment. I will follow up with some more thoughts later.